Tozeur is an oasis town - a narrow band of palm trees, camels, and Land Cruisers that is sandwiched between Tunisia's two great salt flats: the expansive Chott El Gharsa to the north and to the south, the seemingly endless Chott El D'Jerid. I arrived in town in the mid-afternoon of October 23, 2000. After grabbing a quick bite to eat, I set about finding a hotel room that would serve as my "home base" for the next five nights. Almost as soon as I booked a room, I was back in my rented car and on the road in search of my next film location. The road west out of Tozeur continues on to the smaller oasis town of Nefta and beyond that, stretches into civil war-torn Algeria. Over the next few days of my visit, I made a number of trips out this way - always stopping short of Algeria. Instead, I turned off onto one of two, unmarked sandy tracks. One of these tracks was a left turn (north) off of the main road. After just a few yards, it ended at a small souvenir stand. I parked the car and began to venture out onto the sand. Almost instantaneously, I was tailed by several Tunisian youths leading camels. Despite the language barrier, it was clear that they wanted me to hire one. After a bit of haggling, an agreement was reached and for five Tunisian Dinars, I had a camel to ride ... and a Tunisian boy to lead it. I would have preferred to drive the beast myself, but it was not to be. Halfway to the largest dune, I noticed eight small figures rushing down a side dune towards our position. A few minutes later I was besieged by Berber children trying to sell me sand roses and cloth dolls. "Non, merci," I replied with a smile. The children continued to follow as my camel (with me on top) was led toward the small field of dunes. Within five minutes of parking the car, our procession reached the crest of the highest one. 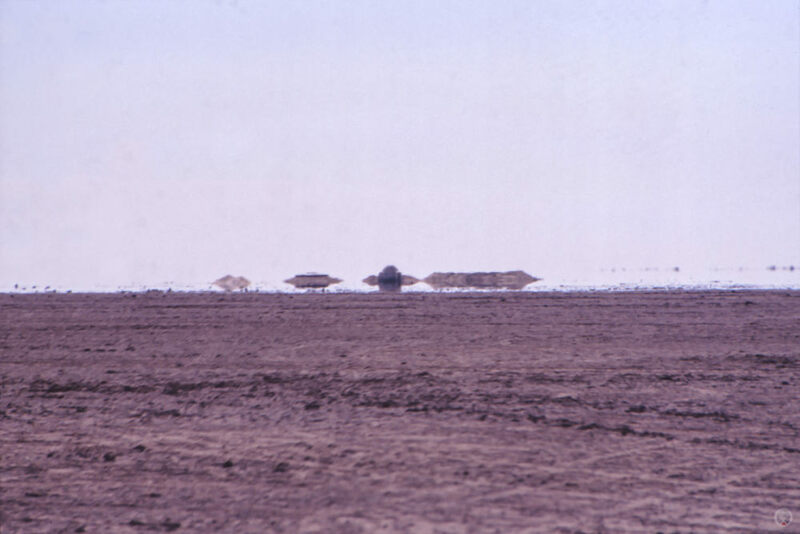 This area served as the location of the escape pod landing at the beginning of the original film. It was also where C-3PO had walked by a huge skeleton (later named that of a Krayt Dragon) prior to being picked up by the Jawas. 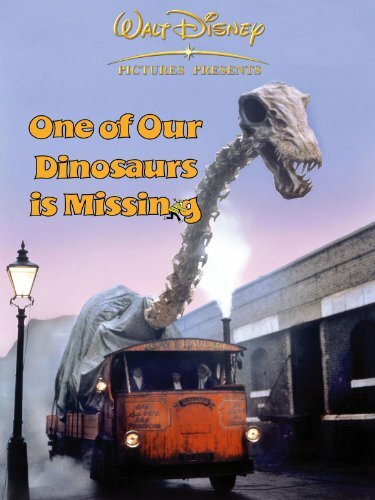 I had known from one of the biographies on George Lucas that the skeleton (re-purposed from the 1975 Disney film ONE OF OUR DINOSAURS IS MISSING) had been left in the sand after filming was completed. 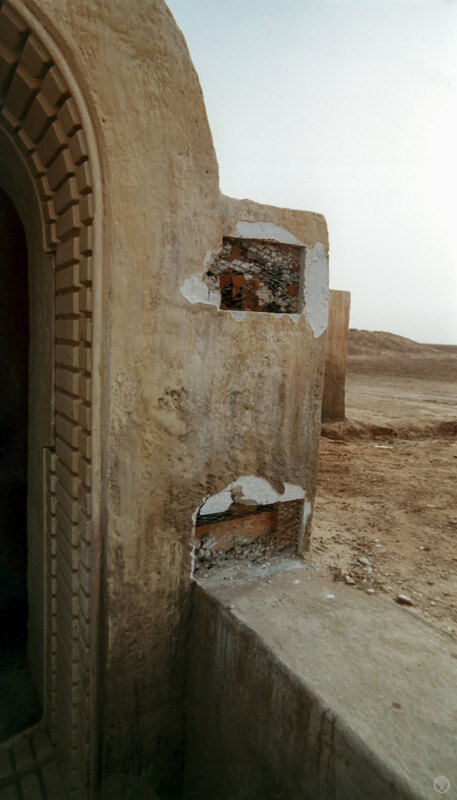 I had also known that pieces of it still littered the area in 1995, as pictures taken of it at that year had been published in the Star Wars Insider fan magazine. Since that time, other fans and locals interested in making a quick Dinar had collected the remainder of the fiberglass dinosaur replicas. The only bits of plastic I found residing in those dunes were the ever-present non-refundable water bottles that littered the country. At some point during my search for bone fragments, I had shown the Berber children a still from the film that depicted the skeleton (see photo #4 below). The image was met with only a few shrugs of disinterest and the children soon moved on to find a more receptive audience for their wares. Or so I thought. As my guide relaxed on the top of the nearest dune, I ventured down to its base to continue my search. A few minutes later, the Berber children returned - this time with a black garbage bag. They opened it for me and revealed several pieces of weathered fiberglass that were quite clearly once dinosaur bone props! I happily parted with twenty Tunisian Dinars for two of the larger pieces. The other sandy track was a left turn that dropped down off the main road and directly onto the Chott El D'Jerid. Once on the Chott, the road was reduced to a set of tire tracks which I followed for a kilometer or so. As I drove, I kept my eye out for anything recognizable. Under the intense African sun, small silhouettes danced and shimmered above the endless horizon. A mirage. Slowly, the shapes congealed into the forms of several reconstructed craters and the domed entrance of the Lars Homestead. The exterior of Luke Skywalker's house originally had been constructed on the Chott in 1977. In the mid-1990s, it had been reported that all that was left were a series of low, heavily eroded crater rings that were barely discernible from the rest of the flat landscape. I had known from an Internet report the month before that the site had been newly rebuilt for the forthcoming film (ATTACK OF THE CLONES). After seeing what the crew had done at Matmata's Sidi Driss the day before, I was anxious to see the state of the Lars Homestead. I arrived to find the internet reports had indeed proved true and the location had been returned as closely as possible to its 1976 filming state. The pits had been re-formed to match the original film as closely as possible, though the word "pit" was somewhat deceptive. In truth, what I actually found on site were two low crater rings. The interior of each was more or less at the same level as the rest of the Chott. 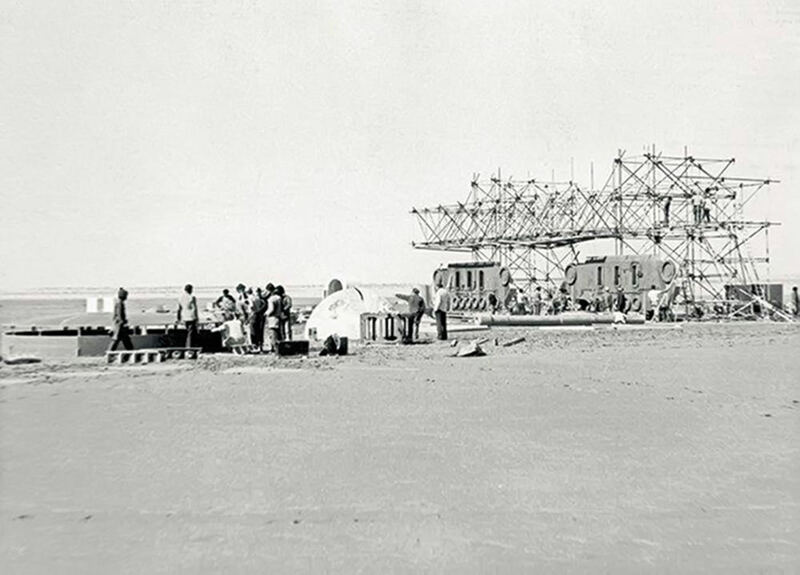 In the original film, clever editing had disguised this fact and created the illusion that the interior (filmed across the country at Matmata's Hotel Sidi Driss) was actually dug on location. When ATTACK OF THE CLONES was eventually released a few years later in 2002, I noticed that this was further refined into a single shot that tilted down from the exterior, into the interior of the pit, and that the two real-world locations had been digitally blended seamlessly into one. A third pit had been covered with a blue roof. For whatever reason, some fans often refer to this as the "hydroponic dome," but it's really intended to be the roof of the Lars' subterranean garage/workshop. In the original film, it's the room where Luke cleans the droids and was actually a set constructed at Elstree studios outside of London. In the second prequel, it was the location of a frustrated conversation between Anakin and Padmé and was shot on a new set built to match the original at Fox Studios in Sydney. You can see a several production stills of the latter set on this page. In both cases, a series of small circles can be seen wrapping the upper edge of the room. This same ring of circles can be seen wrapping the base of the roof in exterior scenes of the films. 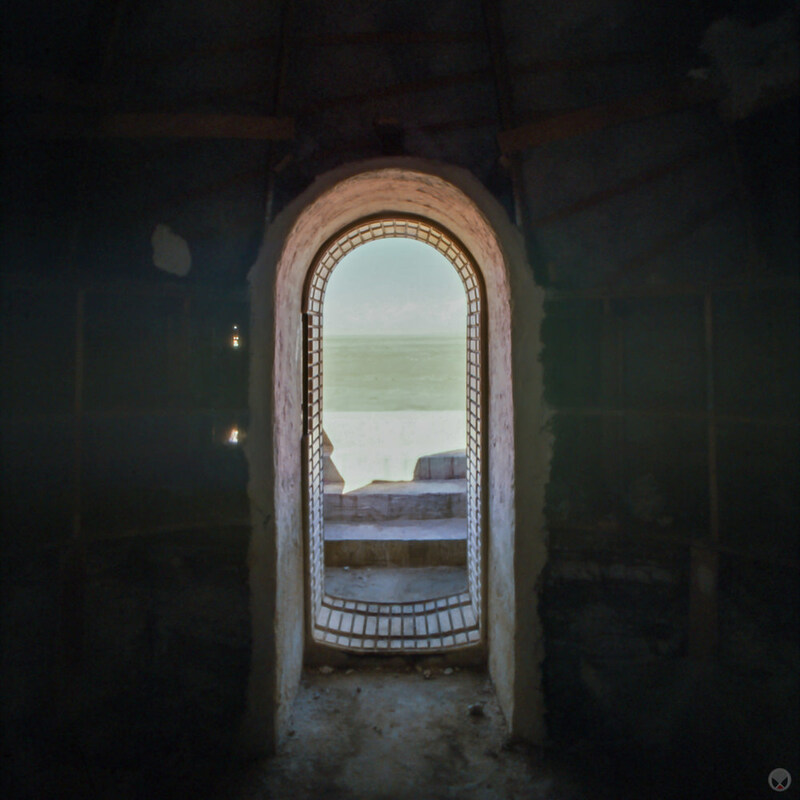 The so-called igloo is more accurately derived from Mediterranean vernacular architecture than it is of Eskimo origin. In the original film, my research suggests that the dome was a single piece attached to a base of masonry units. One of the production photographs above appears to confirm this. For ATTACK OF THE CLONES, it was rebuilt from scratch. This time, the entire structure was framed out of wood and then overlain with wire mesh and finished with whitewashed plaster. The set was then dressed with various bits of technology including various pipes, boxes, an entry keypad, moisture vaporators, and grave markers. None of these were present at the time of my visit. As you will see from my photos, all of those parts were removed and only their "footprints" remained. I assume that some of the larger pieces, such as the vaporators, were relocated to the Mos Espa set - which was refurbished from Episode I for use in Episode II. Oddly enough, a scene from Episode III was shot (or at least begun) during the Episode II location shoot. I was first made aware of this some time after my travels when the production webisode We Didn't Go To The Desert To Get A Suntan was released on starwars.com and cryptically alluded to a scene filmed at the same time for inclusion in the followup film. 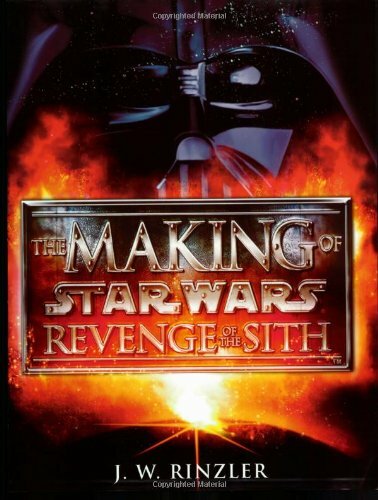 In 2005, the book The Making Of Star Wars Revenge Of The Sith, by J.W. Rinzler filled in some of the blanks. According to Rinzler's narrative, on September 7, 2000 (day 53 of principal shooting for ATTACK OF THE CLONES), Breeden Phillip - a stand-in for Ewan MacGregor who was not with this part of the shoot - was filmed handing a prop infant to actor Joel Edgeron (as Owen Lars). Several years later on September 15, 2003 (day 56 of principal shooting for REVENGE OF THE SITH), this scene was reshot at Fox Studios Australia. This time Ewan MacGregor (as Obi-Wan) was filmed on a blue screen set handing the prop baby to actress Bonnie Piesse (Beru), who then walks to Owen. This time, production assistant Hamish Roxburgh stood in as Owen, because Joel Edgerton was not available. With further post-production work, this single scene was nearly five years in the making. It was also the final scene of the last released film of the original six. In the years since the prequel films have been released, the Tunisian locations have become well known tourist destinations within that country. 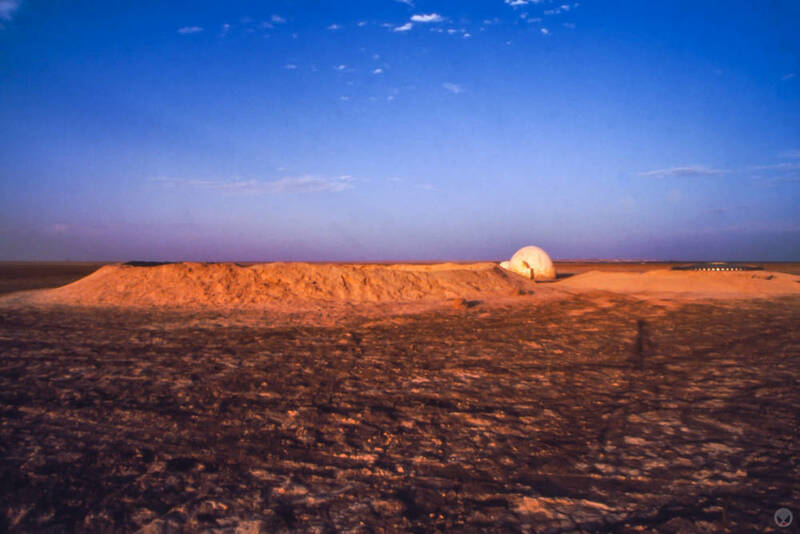 Prior to the "Arab Spring," which saw political unrest in Tunisia and other arab countries, it was not unusual for the Star Wars filming locations to receive upwards of 100,000 visitors (or more) each year. All of that traffic combined with the effects of weather and time contributed to a rapid deterioration of the sets. The Lars homestead in particular suffered rapid aging. I was there a mere month after filming the location shoot and already the roof of the Lars garage had a segment ripped out of it. It's possible that this was done by the film crew to get a lighting into it, but the state of the wound (as seen in one of my photos above) made me think otherwise. 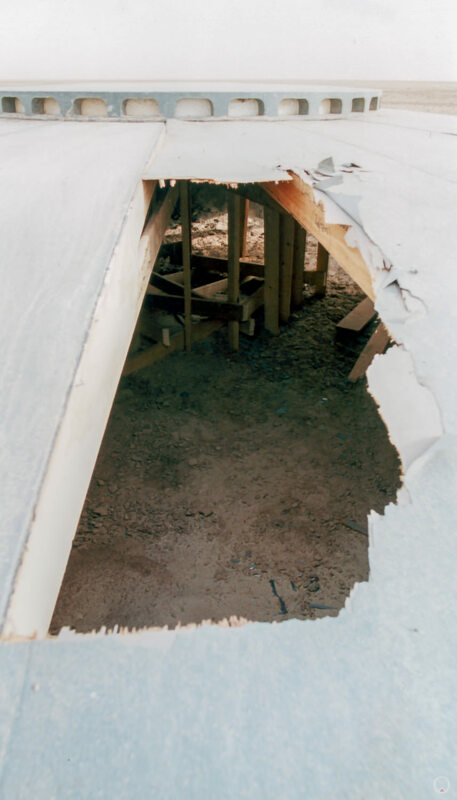 By 2010, the crater rings had softened, the garage/workshop roof was reduced to a twisted ring of scrap, and the iconic dome had more than started to crumble. Around this time, a group of fans took it upon themselves to restore the dome. Using donations from other fans they made a trip to the location in May of 2012. Over the course of a week and using local workers, they successfully restored the "igloo" for future visitors. You can check out their story complete with before/after/in-progress photos (and annoying pop-up advertising) at their site. From Nefta, travel west on P3. The turn-offs for both locations are directly across the P3 from each other roughly five miles out of town. Turn right (north) for La Grande Dune and/or left (south) onto the Chott for the Lars Homestead. Both locations are now well-established tourist destinations and gps coordinates (while fun) are not at all needed. All that's required is to follow the tracks of previous visitors. If that is still too vague, you can see aerial views of both locations via the following links which should give you a better feeling for where they are.